Williamsburg Golf Vacation package travelers have a new course to conquer. Located in New Kent near several other Williamsburg area courses. The Club at Viniterra is a Rees Jones design that is generous off the tee but quickly requires attention when playing approach shots. Green complexes are well bunkered and have a fair amount of slope. Errant iron shots will challenge your short game, but brand new ultra smooth A-4 putting surfaces will make it easy to keep par-saving putts on line. 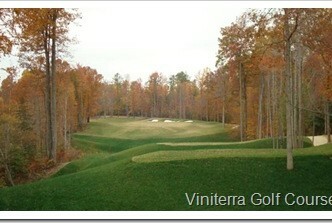 Vinaterra has six sets of tees ranging from 5200 to 7,700 yards, yes 7,700 yards!! 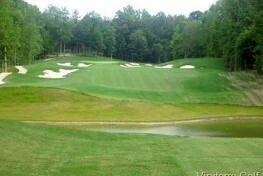 Viniterra golf club is laid out nicely through New Kent’s rolling terrain that features moderate elevation changes and beautiful pine trees forests plus several landmark oak trees adding additional character to this soon to be well-known design! The Club at Viniterra is conveniently located less than 2 miles from interstate 64 between Richmond and Williamsburg, VA. A great option for an afternoon golf round on your way into town or a perfect way to finish your next Williamsburg golf trip. Groups of 16 or more and group leader plays free. Range balls are included and wine connoisseurs can tour the working vineyard located onsite. A Stay & Play Golf trip with affordable condo lodging and great golf! Williamsburg National boasts to distinctly different championship golf courses. The Jamestown Course (newly renovated greens) and the Yorktown Course one of the only courses in the region with over seeded fairways providing green grass fairways all year round. Enjoy spacious condos at the adjacent Greensprings Vacation Resort.